Got questions? 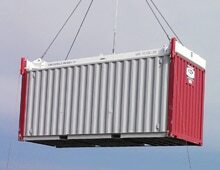 Or want to know more about how Tec Container can help you? 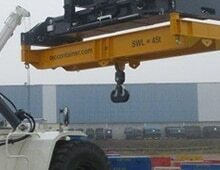 Our Reach Stacker Attachments lead to higher productivity at your cargo handling terminal. Includes Multipurpose Hooks, Special Forks, Clamps and Coil Handlers. 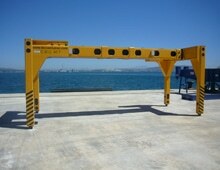 Our range of Container Spreaders improve safety and efficiency and can be attached to harbour cranes. Available in Automatic, Semi-automatic and Special Models. Overheight Frames help your Operators safely handle Oversized Cargoes and can be attached to quay cranes and straddle carriers. Our heavy duty Lifting Beams meet International Safety Regulations and are highly customisable meaning you get the perfect beam to suit your needs. Securing and Fastening are vital in Transport. 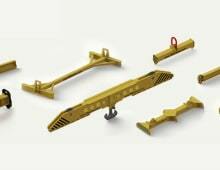 Our range of European design top of the range Lashing accessories give you peace of mind. The range comprises Container Lashing Equipment, Fixed Ro-ro Lashing Equipment, Loose Roro Lashing Equipment and Other Lashing Equipment. Tec Container Asia Pacific is a market leader in the design and production of container unloading, container handling and general cargo equipment in terminals and ports. Backed by 40 years of materials handling experience, whatever your need we can help you source the right piece of equipment for the job. Whether it is for a port, manufacturing or heavy industry. 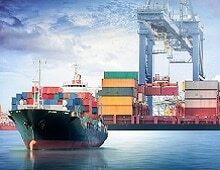 We serve ports and industrial sectors in the Asia-Pacific region including Australia, New Zealand, Fiji, Solomon Islands, Papua New Guinea, Vanuatu, Noumea, Tonga, Samoa, French Polynesia, Kiribati Islands, Marshall Islands, Cook Islands, New Caledonia, Nauru and East Timor. Our products are designed to handle extreme conditions and meet the toughest International industry standards at competitive prices. Let’s explore possibilities – can we find a better way to handle, lift, store, load and unload your goods to reduce operational time, cycles, risk and cost? Innovation is central to all that we do. If you have a lifting need, we have the solution.